An exciting project to write a website using American English for a college graduate based in the United States. Charlotte Brereton was reaching the end of her broadcast communications course at Florida Southern College and wanted a website to promote her skills and experience to potential employers in the entertainment industry. Again I worked with web designer Simon Warbrook on the project and the main aim of the website was to display Charlotte’s resume. I researched other websites for people who work in a similar field to Charlotte in the U.S. and investigated how a resume should be written when aimed at U.S. employers. I carefully edited and rewrote Charlotte’s existing resume, ensuring the content was clear and well-written, while including as much relevant information as possible. 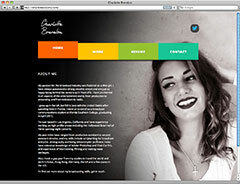 I also provided the copy for Charlotte’s home page, summing up her background and skills.